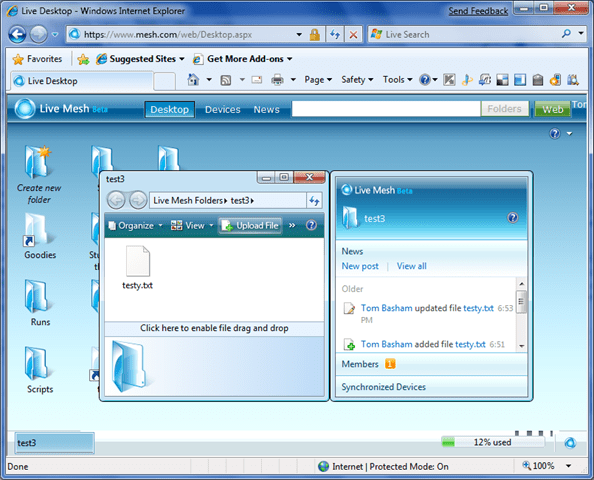 Posted byTom Basham	 Feb 16, 2009 Feb 16, 2009 1 Comment on Live Mesh Desktop… A pointer to a cloudy future? Over the past few weeks I’ve been doing a fair amount of thinking and work about how desktop computing will be delivered in the future. I doubt we’ll be seeing the end of full-fat desktop and laptop computers anytime soon, but change is definitely in the air. Within the enterprise thin provisioning of desktops is gaining pace. Virtual desktops offer significant benefits in utilization, management and energy consumption. Taken further, blade workstations such as HP’s can also offer performance benefits. Especially in a world where data is increasing centralised and the workforce increasingly mobile. The technology now allows true ‘desktop as a service’ solutions to be offered. But what about the consumer and small business world? I’m a big fan of Live Mesh. I now use it on all of my PC’s and the work Mac to keep a single view of my working docs. One thing that I’ve always wondered about though is the Live Desktop. It’s undoubtedly useful as a server side copy of my files but why make it look so much like a desktop? Is it just to deliver a similar user experience? I would love to see the Live Desktop gain some application functionality. We already know that browser based versions of the Office applications are on their way with the Office Web applications. We also know that MS has a huuuuge amount of computing capacity at it’s disposal in the Azure platform. Could the Live Desktop (or something like it) be used to deliver a web desktop with both storage for data and the applications to open and use it? With the capabilities that are coming over the next year or so I can’t see why not. It’s going to be an interesting 18 months I reckon.